I’ll admit, I’ve always been too much of a penny pincher to opt for dryer sheets. I remember getting a box from someone and cutting each sheet in half to make them last longer because I surely wasn’t going to buy any! Of course, that was all before going green and crunchy. Now that I’m into a more natural way of living, I avoid buying dryer sheets for more than just frugal reasons. Dryer sheets, as it turns out are full of nasty ingredients. Did you know that over 25 volatile air pollutants are found in laundry products? These air pollutants are not just harming the air we breath in! They can also harm us. Fabric softeners can cause a whole host of issues for people who are chemical sensitive but even those who are healthy can develop health concerns like asthma just from having nice smelling laundry! 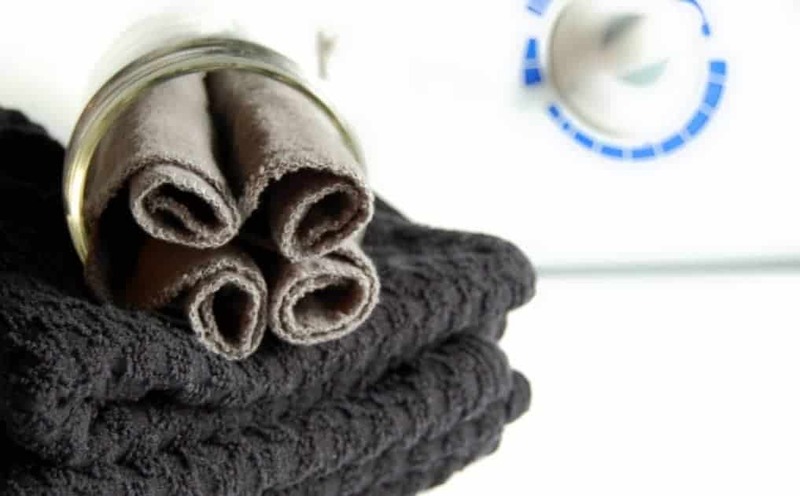 There are other more concerning health issues from laundry products as well, like benzene which has been linked to leukemia according to the American Cancer Society. So I guess my penny pinching ways were secretly helping me all those years ago! However, I know many of you like nice smelling clothes. Not that mine smell gross, mind you! I usually just use my wool dryer balls. But wool dryer balls don’t have that frolic-through-the-flowers smell either… What’s a natural minded person to do? 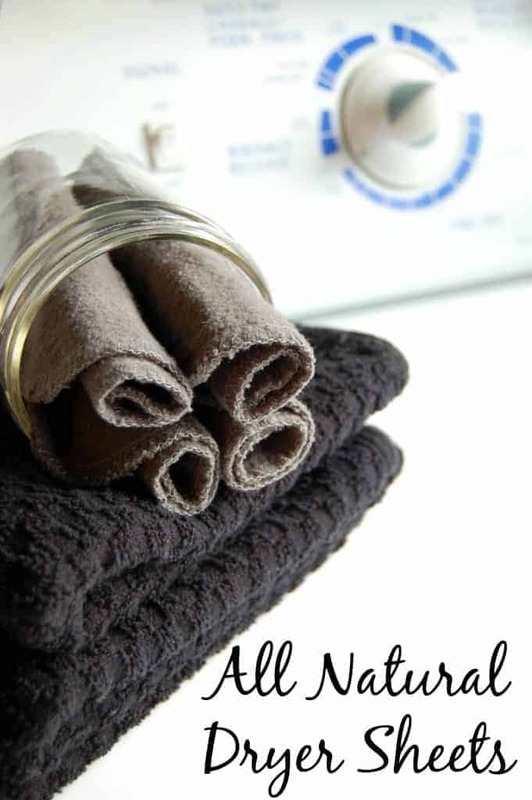 How about some all natural dryer sheets? Yes, this is another DIY but it’s not a very hard one and it’s definitely not time consuming! You really will not spent any more time than you would if you were to pull out a store bought dryer sheet. I promise. 4×4″ fabric squares – any cotton fabric you have will do: old t-shirts, old washcloths. Essential oils – pick your favorite! I love lavender, lemon, or even grapefruit! Place 3-5 drops onto one fabric square just before turning on your dryer. Toss fabric square into your dryer with wet clothes and turn dryer on. When laundry is dry, your clothes should smell great! Locate fabric square and return back to your laundry room so that you have it for your next load. Reapply essential oils for each new load of laundry. You really only need one fabric square as you can only dry one load of laundry at a time… but if you aren’t going to be searching for that dryer sheet before running another load (you are trying to create Mt. Laundry, for instance) then, it’s a good idea to have 3-5 dryer sheets. Note: You could also just stick the essential oils on your wool dryer balls if you already use those! I’ve never used dryer sheets–until now. Never saw the point. The scents made me sneeze. But I love this idea! I could give all my clothes and household linens a little hint of orange blossom or lavender. I have the cloths already, as we cut up old towels, washcloths and t-shirts to use in place of paper towels and I have quite a supply! Going to give this a try with the two loads I’m washing today. Thanks so much! Oh my. This is so simple and doable! Can’t wait to start using these! I do not know why I didn’t think of this! I use wool dryer balls and I think I will just put the essential oil bottle in the laundry room and add it each time to the dryer ball — except for my hubby’s farm clothes. Haha! Maybe the cows would enjoy him not smelling like grease and oil though! Seriously thanks so much for this simple idea! What a great idea. I also use yarn dryer balls but miss the fresh smell. Thanks for sharing. Thank you so much for sharing these green and healthy All Natural Dryer Sheets with us on the Healthy Happy Green and Natural Party Blog Hop. I’m pinning and sharing. I used homemade dryer sheets for quite a while much like yours but then I decided to try the organic wool balls and am still using them. I love them and they work great. Congratulations on being being featured on Healthy Happy Green & Natural blog hop. I cannot use dryer sheets due to my skin issues. Does this method eliminate static? No, it really doesn’t help much with static. If you are looking for something to remove static (and fluff laundry) then I recommend wool dryer balls. I love it! so simple and uses stuff that you already have around the house! As to the respiratory concerns, that is a huge reason not to use the commercial dryer sheets , especially if you have children.